Recently I have contacted Typemock and I was offered a license of Typemock Isolator, their flagship tool, in support of my OSS project LINQBridgeVS. Typemock Isolator is a viable tool to incorporate CLR interception for unit testing in .NET. Typemock Isolate contains the Typemock Isolator Mocking API, a fluent API to fake and mock objects based on the Arrange-Act-Assert pattern, and Insight which gives detailed information about the behaviour setup during test debugging. Typemock Suggest suggests and creates tests, for either NUnit or MsTest, for methods and classes in legacy or mainstream code that have partial to no test cover. Typemock SmartRunner is the built-in test runner and identifies and runs only the impacted tests after the solution’s tests have run for the first time. This includes all modified tests and those tests that need to run because the code they test has changed. Typemock Coverage is a code coverage tool that displays code coverage for tests, methods, all classes or only those that have recently changed or the entire solution. It also display real-time code coverage while code is written. Typemock Isolator for .NET has three different types of licenses which are offered in two versions: annual or perpetual. The price starts at €479 pa or (€899 perpetual) for Isolator Essential which comes with the mock framework, the test runner and method coverage. Isolator Complete adds Auto-generated test suggestions and it costs €799 pa (€1599 perpetual). The last one is Isolator for Build Server which adds support to run tests on up to five machines and comes at €1119 pa (€2499 perpetual) . For more information visit the pricing page. Typemock is free for MVPs and there is also support for open source projects, although not directly advertised through their website. If you’re interested in having a license for your open source project get in contact with them through the contact us form and send a brief description of your project. Writing unit and integrations tests is a vital part of the software development life-cycle. It is often underestimated and left as the last part of the development. Achieving an extended test coverage is extremely important for the creation of a reliable and stable product. Techniques and principles from Test Driven Development could be used by teams to make the creation of tests easier. Reality is often different though. It is a rare opportunity to work on a brand new project where both the design and the development process can be decided from the beginning. Often enough a team determined to follow TDD principles ends up not allocating enough time to hit the desired coverage or tests are not strictly written first. In such cases it is preferred to offload developers and delegate QA teams to write automation tests or to test an individual feature manually. Clearly this approach is not scalable and doesn’t guarantee stability over time. When code changes are not monitored by both unit and integration tests it is very hard to estimate and also to predict the impact that a specific change will have to other parts of the system. Unless TDD principles are followed and a robust and clean design is made from the very beginning, the process of writing tests in isolation becomes increasingly more difficult as the project evolves and cannot be achieved without proper (and often painful) refactoring. Mock object frameworks simulate objects’ behaviour. A mock is something that is setup as part of a test so that it returns an expected result. Mocks in a way are determined at runtime since the code that sets the expectations has to run before they do anything. As a rule of thumb mocks are used to ‘fake’ dependencies of a class. When a method or a class is tested in isolation, i.e. when a a unit test is written for it, dependencies to other systems should be mocked. There are a lot of free open source mock framework for C#: Moq, RhinoMocks, FakeItEasy and NSubstitute just to name a few. There is also a built in Visual Studio version called Microsoft Fakes. The aforementioned frameworks (except for Microsoft Fakes) have one peculiar aspect in common: they can only mock a class given its interface or its base class as long as the base class is inheritable and it declares virtual methods for the behaviours to be setup. Sealed classes, static classes and non-virtual methods cannot be mocked with the proxy pattern approach most mock frameworks use. A proxy is a class functioning as an interface to something else. The proxy has to implement the same interface as the Subject so that the Client doesn’t realise that it is using a proxy. Mock frameworks in fact create proxies at run-time based on interfaces or abstract classes and they are able to override any virtual method. The Proxy Pattern class diagram. In the arrange section of the snippet above, Moq creates a proxy that inherits from the class Auth. During the setup, a call to IsAuthValid is overridden so an expected value is returned by default when the method is invoked. The method IsAuthValid however must be virtual, otherwise Moq won’t be able override it and will raise an exception. I changed the class Auth to be sealed instead and I also made the method IsAuthValid non virtual. Classes should either be designed for inheritance or prohibit it. There is a cost to designing for inheritance, and unless there is a good reason, it should be avoided. Private or non-virtual methods cannot be tested using a proxy based mock framework. The alternative is using Microsoft Fakes, which I mentioned earlier, and it has similar features to Typemock Isolator. Microsoft Fakes has support for either proxy-based mocks, which are called stubs, and method interception mocks called shims, which diverts method calls at run time. With Microsoft Fakes every assembly needs to be faked manually. For example if you need to generate a mock for a .NET system type, like DateTime, then a Fake for the System.dll must be created and referenced in the test project. Microsoft Fakes has also some other limitations. Please refer to this link for a detailed comparison of Microsoft Fakes vs Typemock. At this stage one could argue that the current design for the Auth class is poor and a better one would be to abstract away the dependency that authenticates the user from the Auth class. The Bridge Pattern class diagram. There is one important caveat to keep in mind though. When Isolate.WhenCalled is used to define a fake behaviour on static methods and/or static classes, the behaviour has a global scope. This means that the setup will redirect calls from other unit tests also. It is in fact good practice to mark the test class with a specific attribute available in the Typemock API called IsolateAttribute which makes sure all behaviors are reset at the end of a test method. Abstracting away the access to a database is no easy task. One common route is to implement the Repository pattern to abstract away the data access logic, so unit tests can use stubs or mocks as implementations of the IRepository interface. Another solution, if an ORM like Entity Framework is used, could involve faking the DbContext itself instead of wrapping everything with the Repository pattern. There’s a good article here with a thorough explanation on the topic. In the snippet above, the method FindUser fetches users from a repository using a LINQ query. Instead of changing the behaviour of the method, or faking the repository, it is also possible to fake the result of the query itself. It’s a bit obscure to me though the criteria the API uses to swap the original LINQ query with the one setup in the unit test. I looked up at their official documentation on the topic, but I couldn’t found anything that hints at how linq expressions are swapped around. Regardless of the gore details this feature is very powerful. Typemock Isolator integrates with the several famous build and continuous integration servers like CruiseControl.NET, Jenkins CI, TeamCity and Team Foundation Server, as well as custom build servers. There is a good bit of documentation on their website about Server-side integration. I personally use Appveyor, a free continuos integration solution for Windows and Linux that integrates nicely with GitHub. Typemock doesn’t integrate with Appveyor as easily as it does with the official supported build servers. Tests that use CLR interception must be run by TMockRunner, a utility part of Typemock Isolator that launches external programs like code coverage tools or a unit test runner like MSTest. There is some documentation that explains how to run TMockRunner and also how to install it on a custom build server. I’d have preferred to have everything in a single page (or section) so I didn’t have to jump around to find what I needed. It took me a while to figure out a powershell script that worked nicely with Appveyor. Appveyor runs any custom script with low privileges, thus access to the windows registry is forbidden. TMockRunner needs to access the registry for the initial setup, so I had to come up with a hack to set some specific environment variables to trick TMockRunner into thinking there was no windows registry available. Luckily the support team in Typemock offered a better solution by suggesting to elevate the privileges of my custom powershell script. 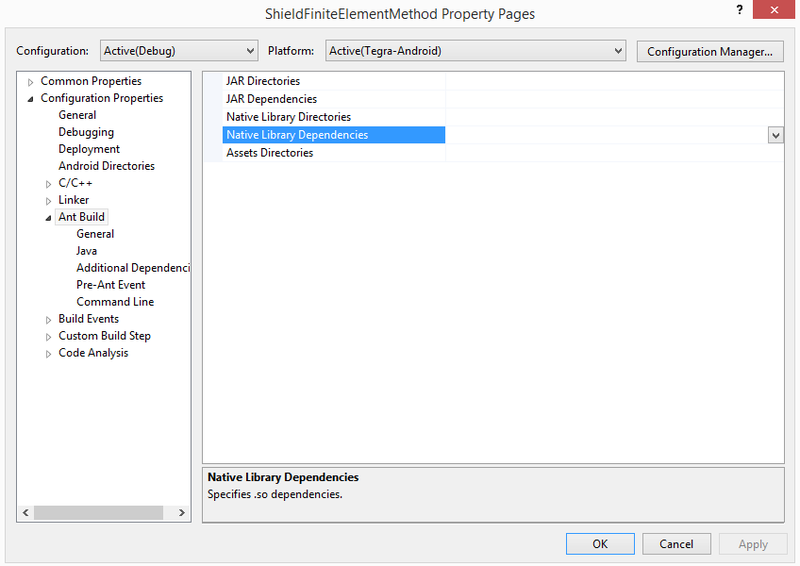 The ability to override methods and classes everywhere, and also in some .NET classes, is very powerful. It enable developers to write unit tests in isolation in both legacy code where there is none to very little degree of freedom and also in mainstream code. Such freedom shouldn’t be an encouragement to write poorly designed software and TDD (or BDD) should always be the preferred approach when possible so that tests are guaranteed to be part of the product from the very early stages. The other side of the coin is that a software architecture should always be designed around the problems it solves and the tasks it performs. Being forced to declare methods virtual, avoid sealed or static classes or create a lot of interfaces to abstract any dependency, if not for some technical limitation of mock frameworks, is in my opinion unnecessary. On the cons Typemock is not yet compatible with .NET Core and I guess the reason is the different common language runtime (the CoreCLR) .NET Core uses. Also Typemock Suggest needs to be disabled or it will crash if you’re working on a .NET Core project. I also struggled a bit to setup Typemock in Appveyor, adding the relevant steps I highlighted in this article in their official documentation would be of great help. Another improvement is keeping the Visual Studio extension in sync with the version of the Typemock API. If they mismatch, e.g. you update the Typemock API to a newer version using NuGet but not the extension then an exception is thrown when unit tests are run. I really had fun creating tests on my OSS project using Typemock. For long time I didn’t have much test coverage and finally I was able to increase it in relative short time without doing a huge refactor. The fluent API is very intuitive and easy to use. I hope Typemock will add support for .NET Core in the near future. This is it, I hope you enjoyed reading this article, see you soon! NDepend is static analyser for .NET and .NET Core. Recently I was contacted by its creator, Patrick Smacchia, who kindly offered a license in support of my OSS project LINQBridgeVs. NDepend is a tool mainly targeted for software architects who want to have a deep insight into their projects. NDepend gathers data from a code base and includes code quality metrics, test coverage statistics, assembly dependencies, evolution and changes, state mutability, usage of tier code, tech debt estimation and more. Another interesting feature is the ability to write custom rules using a domain specific language called CQLinq, which is based on LINQ, C# and the NDepend API. NDepend comes with tons of features and it feels overwhelming at first. It has a quite steep learning curve before getting familiar with it. However there is lot of documentation, both on the official website and also in App which helps a lot. There are two types of licenses: per seat (€ 399.00) for developers that use the UI (or the stand-alone app), and per machine (€ 799.00) for servers that integrate NDepend into their build process. This price model is probably not a problem for companies but it might be a for individual developers. Although it is not advertised on the website there is official support for MVP and open source projects. Microsoft MVP are eligible for a free personnal license. Get in touch at this email address mvp@ndepend.com. NDepend does not have an installer, it comes in a zip file, but its setup and first activation are pretty straightforward. Check out the introduction video on how to install it and get started. NDepend.PowerTools shows how to make the best out of the NDepend API syntax. It contains a lot of examples for code rules checker, code diff reporter, handy development tools, build process checker, etc. I’ve been using NDepend for quite a while now and honestly it took me some time to get my head around the UI and the tons of features this tool is shipped with. The amount of information is at first overwhelming, and in my opinion the UI at times contains a lot of information. However after a few hours of usage I felt I was more confident to use it and it became easier to search and find what I needed. The Visual Studio integration is handy, as you don’t have to leave Visual Studio. New reports are generated after successful build and it’s possible to compare metrics across different analysis. Having a second monitor is advised though as it makes it tidier and easier to keep the NDepend window on one monitor and avoid annoying switching between windows. One feature that caught my eye is the technical debt estimation (TB). The TB metaphor was coined in 1992 by Ward Cunningam, a design pattern and extreme programming pioneer. Think of TB as a financial debt. It must be paid at some stage and it accumulates with other debts, generating interests and prolonging the time needed to pay it back. I’m sure at some stage in every software developer’s carrier there grows an urge to refactor the code and reality is there is never time for it. Unfortunately strict deadlines or difficult targets lash back leading to hacks, quick fixes and poor design decisions in favour of quicker releases to satisfy customers. Technical debt is often underestimated as it is seen as a cost that doesn’t produce an immediate benefit. “It’s just code!” as they might say. The technical debt estimation in NDepend produces an estimate, expressed in man-hour to fix code issues found. Settings can also be changed for the average cost of man-hour of development, the currency, the estimated number of man days to develop 1000 logical lines of code, scale debt rating percentage etc in the debt settings. The ability to calculate the cost of technical debt and monitor it over time is a great advantage especially to communicate it to non technical people and justify how a refactor or a new re-design could save a lot of time and money over time. Under the hood NDepend uses code rules, i.e. code metrics, to calculate debt and are grouped by: application, assemblies, namespaces, types, and methods. When a rule is violated then there could be a code smell, poor object oriented design, immutability and/or threading issues, naming convention consistency across types, methods and namespaces, source file organisation and so on. NDepend Dashboard – I got a B! Every number in the dashboard is interactive. Clicking on any of them generates a reports, which is essentially a specific CQLinq query run in a temporary preview tab (like the temporary preview documents in Visual Studio), which can be found in the “Rule Editor Window”, i.e. the NDepend query editor. Debt: the estimated effort to fix the issues. Annual interest: The amount of time needed required to fix the issue if left unfixed. Breaking point: it represents the time-point from now to when the estimated cost-to-fix the issue will reach the estimated cost to leave the issue unfixed. It is calculated by dividing the estimated debt by the annual interest. The breaking point is inversely proportional to the Return On Investment of fixing an issue. Thus the lower the breaking point, the higher the ROI. The grid in the image below shows 19 rules that need to be addressed, two of which are flagged as critical. In NDepend critical rules represent high priority rules that must never be violated. They are marked with a red triangle over the exclamation mark. Hovering the mouse over a rule or clicking on it opens a floating panel that contains a thorough description of the issue and often link to a discussion page on the topic. Double clicking on a rule opens instead its corresponding CQLinq source. The two violated critical rules are: “Avoid having different types with the same name”, and “Avoid non-readonly static fields”. I only agree with the first rule partially. I wouldn’t want to have a huge number of different types with the same name as that in fact could easily generates confusion (and probably is a sign of bad design). However if there are only a few types with the same name I believe it’s not going to be an issue. It is not uncommon to have shared names across types in different domains. For instance, in the .NET Framework, the class Timer is defined either in the System.Windows.Forms.Timer and also in System.Threading.Timer namespace. The former is a timer suitable for Windows Form environment and it runs on the main thread as it is often used to modify properties on a form. The latter instead is a thread timer and provides a mechanism for executing a method on a thread pool’s thread at specified intervals. The two classes, despite the same name, do similar things in a very different way. One could argue that the two timers could be called with different names, e.g. FormTimer and ThreadTimer but the disambiguation is better managed at namespace level. Increasing the minimum number of types allowed with same name. The second critical rule “Avoid non-readonly static fields” is a warning for an OOP design flaw. Static fields are states shared with every instance of the class where they are declared. If they are mutable then extreme care must be taken to initialise and to reset them correctly. In a multi-threaded environment mutable static fields are not thread-safe. Race conditions cannot be avoided, and in this scenario bugs could be very hard to trace and even to replicate. It is important to make static fields immutable and private. The rule however suggests to declare them as readonly but that by itself doesn’t enforce complete immutability. Readonly guarantees that the instance can only be assigned once during the construction and it cannot be changed during its lifetime in the AppDomain. For instance, in a readonly List or a Dictionary, values can still be added or removed. Clearly it’s up to us to “protect” those fields from being modified by enforcing immutability. To read more on the topic a good explanation can be found here. In my specific case I declared a public static string in a class (I know it’s horrible) called RavenWrapper. Such class has been designed to be a Singleton that uses lazy instantiation. I wrote this class as a separation layer for the Raven SDK, a library that sends errors to Sentry (an open source error tracking system). More on the singleton later. 6 methods use the public static field VisualStudioVersion directly. The public static string represents the version of the Visual Studio instance where LINQBridgeVs is running on. For “convenience” (truth is laziness) I set this field once outside the class so that I don’t have to pass the vs version all the time as a method parameter. The choice of a singleton class doesn’t help either. I can’t overload the constructor to do the most obvious thing: make the field private, non-static and read-only and let the constructor initialise it. Looking back at it now, I realise there was no real benefit in having this class as a singleton. I should probably have made the RavenClient static, readonly and private. Even in that case there is no advantage really. RavenClient doesn’t open or reserve a connection when it is instantiated, so there wouldn’t’ be any benefit in “caching” its instance. When I ran another analysis on the solution I surprisingly found that the debt went up by 2%. Also 4 more rules were violated (1 of which was critical). It didn’t seem the change I made to the class was the right one. Let’s see again what NDepend thinks about RavenWrapper now, and how many rules I fixed/broke. RavenWrapper – More violated rules. Despite the number of violated rules hasn’t changed, the total cost, the debt and annual interest has halved just by resolving the first critical rule. Although I am not quite there yet, I think I’m on the right track. Interestingly NDepend now recognises the RavenWrapper uses the singleton pattern while it didn’t when the it was implemented using lazy instantiation. The singleton is considered by many an anti-pattern and there can be found a lot of different opinions around the web. On the corresponding violated rule there’s an interesting link to an article that treats the topic extensively. RavenWrapper – Two violated rules only. The “API breaking changes Methods/Fields” rule warns that the current API has changed since the baseline and a method or a field has been removed. These warnings are very important for SDK development because a change in the API can break that rely on them. This is not relevant to me though as this is a Visual Studio extension and not a library like JSON.NET or Moq for instance. It’s been fun to play around with NDepend. I brushed up my skills on code metrics, OOP design practices and code smells. Although it is a software targeted for skilled software architects I also believe it could be a great learning opportunity for mid and senior developers. I can’t of course say if this software is the right one for you as it very much depends on your needs, budget and size of your project. NDepend has a lot of features and it’s fully configurable although the first few hours will be a bit of a pain. NDepend is very broad it might take a long time to master it. There are plans though to release with the next version of NDepend a simplified beginners VS menu, that can be switched to the actual one at any time. Also a series of 2 minutes intro video will be released soon for each feature. I hope you enjoyed this article. Try NDepend if you get a chance, you can download a 14-day trial evaluation here. If you instead want a boost during your debugging sessions try LINQBridgeVs, and let me know what you think in the comments below! Long time ago I posted an article on how disposable value types were treated in Unity and why they used to generate unnecessary and unwanted garbage. It emerged that in the official Mono compiler as well as in the Microsoft C# compiler (but not in Unity) a violation of the C# specification lead to an optimisation of disposable structs within a using statement. Disposable value types are used in C# mainly to implement iterator blocks, which are used to iterate over collections. Two years ago I decided to fix this issue by re-implementing the enumerators in a library called C5 which is a project for generic collection classes for C# and other CLI languages. However with the release of Unity 5.5 back in March 2017 version 4.4 of the Mono C# compiler was shipped and finally this issue was properly fixed and became history. This solution is not relevant anymore 🙂 unless you use an old version of Unity but I would still like to share with you the solution I came up with before the release of the new Mono compiler. C5 implements a lot of data structures not provided by the standard .NET Framework, such as persistent trees, heap based priority queues, hash indexed array lists and linked lists, and events on collection changes. The source code is available on GitHub and MIT license makes you free to modify and re-distribute it if you want. I started my journey in creating my own enumerator implementation for the main collections (ArrayList, DictionaryHash, SortedDictionary etc) and I came up with the idea of a “reusable” enumerator. With this approach only one enumerator instance per collection iterated is used at a time. Naturally this has some limitations. For example, multiple iterations of the same collection, multithread access and LINQ will not work. Normal: An enumerator is created anytime the collection is iterated. This is the normal behaviour expected and thus is not memory safe, but supports multiple iterations, multithread and LINQ. Safe: An enumerator is created once and then re-used. This approach doesn’t generate garbage. However, if the collection is iterated using nested loops or accessed by multiple threads, a new enumerator is created. The collection will save memory unless it is forced not to do so. Strict: An enumerator is created only once. This approach doesn’t generate garbage at all cost. if the collection is iterated using nested loops or accessed by multiple threads an exception is thrown. Figure 1 and 2 shows two different scenarios: in the former garbage is generated by iterating over an ArrayList while in the latter no garbage is reported by the memory profiler. MemoryType.Normal replicates the normal behaviour. The amount of garbage generated depends really on the size of the struct that is used to iterate the collection, therefore its size can vary. Figure 2 shows instead that no garbage is generated when an ArrayList is iterated. This is possible by reusing the same enumerator. Although it is not shown, 56 bytes are allocated only the first time the collection is iterated. //-1 means an iterator is not in use. Everything happens in the GetEnumerator() method. In normal mode the enumerator is always cloned while in safe mode the enumerator is cloned only for multithread access and/or multiple enumerations, otherwise the same instance is reused. The strict model optimise at all cost but throws an exception for the other cases. When I started making games using Unity, after almost 10 years of C# development, I was very concerned to acknowledge that foreach loops are highly avoided in Unity because they allocate unnecessary memory on the heap. Personally I love the clean syntax of a foreach. It aids readably and clarity and it also increases the abstraction level. However a very clear and neat explanation of the memory issue problem can be found in a blog article posted on Gamasutra by Wendelin Reich. I really love reflection. Reflection is a technique used for obtaining type information at run-time. It’s not only that, with reflection is possible to examine and change information of objects, to generate (technically to emit IL) new classes, methods and so on still at runtime. It’s a powerful technique but it is known, under certain circumstances, for being slow. If you are a game developer and you are targeting mobile devices (iOS or Android for instance) using Unity, you definitely want to preserve your memory and save precious clock cycles. Moreover, with AOT (Ahead of Time compilation) IL cannot be emitted at run-time as it is pre-generated at compile time. Therefore a large part of reflection, e.g. expression trees, anonymous types etc., is just not available. typeof(MyClass), which is an operator to obtain a type known at compile-time. GetType() is a method you call on individual objects, to get the execution-time type of the object. Type.GetType(“Namespace.MyClass, MyAssembly”) gives you a type from its string representation at runtime. Recently I have struggled a lot to profile a CUDA application on the Shield Tablet. If you were thinking “What the hell would you need a CUDA app for, on a tablet?” I would understand :D. CUDA it’s not for everyday use but can be very powerful. As of now (Late 2015), the Shield has the most powerful mobile GPU on the market (Tegra Kepler architecture with 192 streaming processors). I decided to evaluate and profile physics algorithms using such architecture. 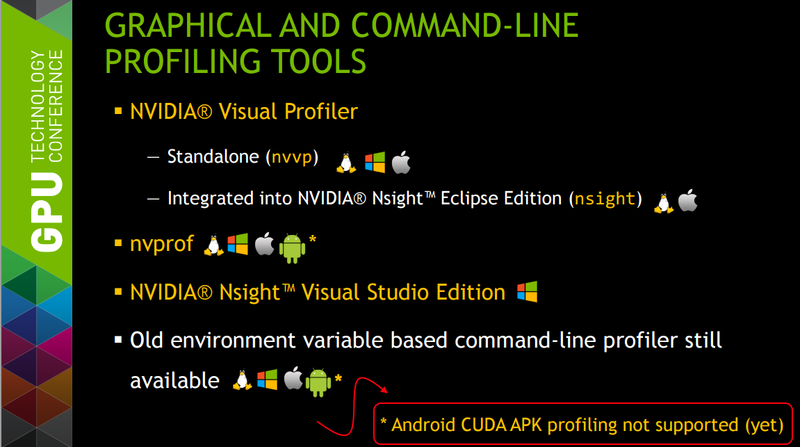 Reading through documentations, keynotes from GDC, and presentations I found out that is currently not possible to profile a CUDA application from an APK!